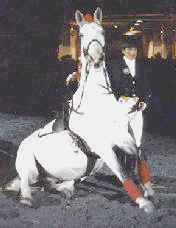 with Prussian Dudley at the Washington International Horse Show. Prussian Dudley was born here at Shine-A-Bit Farmin 1972. His mother, Prussian Annie, was a Trakhaner/Saddlebredcross. His sire, Prussian Gold, was also a Trakhaner/Saddlebredcross, whose dam is Shine-O-Bit. I retired Dudley in 1992 eventhough we were still performing exhibitions from coast to coast.He, along with Gahalla, is on the Shine-A-Bit advisory committee.